Perfect for Atlantic, Pacific or sock-eye salmon (and similar fish like trout) this marinade and glaze is a simple a deli Looking for different ways to incorporate fish in your meals… variety. BBQ or bake in the oven. 1. Mix the crushed garlic, grated ginger, olive oil and maple syrup in a bowl. 3. Preheat oven to 350F. Remove salmon from marinade and place on bed of sliced onions. Top with black pepper and a pinch of salt. 4. 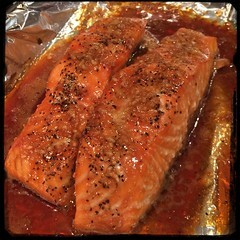 Let cook for 10-15 minutes and then drizzle or brush some of the left over marinade on top of the salmon. 6. Let cook for a final 5-10 minutes.